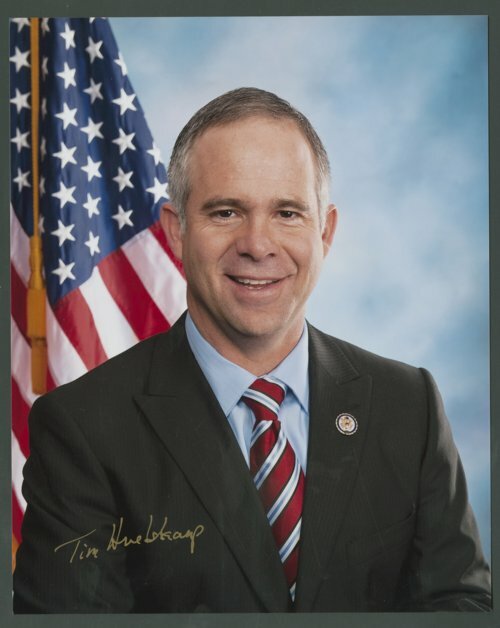 This is a photograph of United States Representative Timothy Alan (Tim) Huelskamp, who represented the First Congressional District of Kansas. He was born and raised on the family farm near Fowler, Kansas. The farm operation includes raising corn, cattle, wheat, milo, and soybeans. Huelskamp attended elementary and high school in Fowler, Kansas, where he was a Farm Bureau Youth leader, a member of St. Anthony's Parish, and active in both 4-H and Future Farmers of America. Following high school, he attended a seminary in Santa Fe, New Mexico, and pursued his bachelor's degree in social science education at the College of Santa Fe. After his undergraduate education, Huelskamp accepted a scholarship to pursue doctoral studies at the American University in Washington, D.C. In four years, he graduated with a Ph.D. in Political Science with a specialization in agriculture policy. While in graduate school he met and married his wife Angela. Upon graduation, they returned to the farm near Fowler to raise their family. Before coming to Congress, he was elected to the Kansas Senate in 1996 and re-elected three times. Congressman and Mrs. Huelskamp are the parents of four adopted children: Natasha, Rebecca, Athan and Alexander.